Elizabeth Spires, Co-Director of the Kratz Center for Creative Writing and Professor of English, holds Goucher’s Chair for Distinguished Achievement (with her husband, the novelist Madison Smartt Bell). Born in 1952 in Lancaster, Ohio, and raised in nearby Circleville, she received a B.A. from Vassar College in 1974 and an M.A. from the Johns Hopkins University in 1979. Professor Spires is the author of six collections of poetry: Globe (1981), Swan’s Island (1985), Annonciade (1989), Worldling (1995), Now the Green Blade Rises (2002), and The Wave-Maker (2008). She has also written six books for children, including The Mouse of Amherst (1999), I Am Arachne (2001), and I Heard God Talking to Me: William Edmondson and His Stone Carvings (2009). 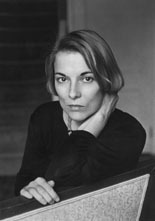 Her poems and reviews have appeared in The New Yorker, The Atlantic, The New Republic, Poetry, American Poetry Review, The Paris Review, The New York Times, The Philadelphia Inquirer, The Washington Post, The Chicago Tribune, The Los Angeles Times, and in many other literary magazines and anthologies, including five volumes of The Best American Poetry and four volumes of the Pushcart Prize anthology. Professor Spires is the recipient of the Amy Lowell Travelling Poetry Scholarship, a Whiting Writer’s Award, a Guggenheim Fellowship, two fellowships from the National Endowment for the Arts, the Witter Bynner Prize from the American Academy of Arts and Letters, two Ohioana Book Awards, and the Maryland Author Award from the Maryland Library Association. In 2011-12, she held a Cullman Fellowship at the New York Public Library. Professor Spires is also the editor of The Instant of Knowing: Lectures, Criticism and Occasional Prose by Josephine Jacobsen. To read poems by Elizabeth Spires go to www.poetryfoundation.org.